Genesee students and employees are eligible to get Microsoft Office for their home use. This is only available online and you need to use your Genesee email as part of the process. FACULTY AND STAFF: Stop! Send an email to helpdesk@genesee.edu for information you need in order to proceed properly. Put your Genesee email address in the box and click “Get Started” — that will send an email to your Genesee email and you need to carefully follow the directions from there. You should end up with a new account on www.office.com that uses your Genesee email as your username and whatever password you have selected. As a reminder, this password is NOT connected to our existing Genesee passwords. The page you land on will look something like this. You can use the Office components online and save your documents in the cloud storage. 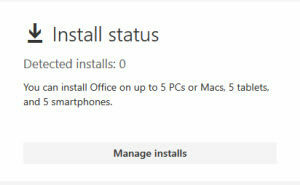 Once there, click on Install in the menu and follow the directions from there. 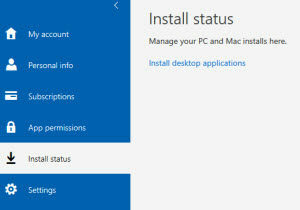 You have a limited number of installs for your personal use — you manage where you install the software from the “My Account” menu.